2007 marked the debut vintage for Domaine de l’Aurage. 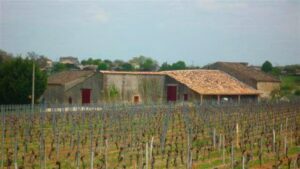 Domaine de l’Aurage is the third Bordeaux vineyard owned by the Mitjavile family. The other chateaux are: Tertre Roteboeuf in St. Emilion and Roc des Cambes in the Cotes de Bourg appellation. Today, the vineyards are owned and managed by the capable, LouisMitjavile and his sister, Caroline Mitjavile. 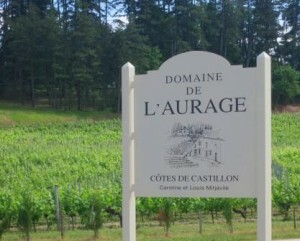 Domaine de l’Aurage was previously bottled under the name Chateau Cadet, before it was purchased by the Mitjavile family. The 18 hectare, vineyard of Domaine de l’Aurage is 90% Merlot and 10% Cabernet Franc. On average the vines are 25 years of age. The terroir is the perfect combination of good limestone and clay terroir soils just across the border from Saint Emilion. However, it is the goal of Louis Mitjavile to slowly but surely continue removing the Cabernet Franc vines and replacing those vines with Merlot in their Right Bank Bordeaux vineyards. It is also the plan for Domaine de l’Aurage to have their entire vineyard eventually planted to 100% Merlot vines. The wine is vinified in traditional concrete vats and is on average aged in 80% new French oak barrels. However, that is not always the case. For example, in 2010, the wine was aged in 100%, new, French oak barrels. On average the production is close to 7,500 cases of wine per vintage. The best vintages of Domaine de l’Aurage are: 2018, 2017, 2016, 2015, 2012, 2010 and 2009. Domaine de l’Aurage is much better with at least 2-3 years of aging in good vintages. Young vintages can be decanted for 1 hour or so. This allows the wine to soften and open its perfume. Older vintages might need very little decanting, just enough to remove the sediment. Domaine de l’Aurage offers its best drinking and should reach peak maturity between 3-10 years of age after the vintage. Domaine de l’Aurage is best served at 15.5 degrees Celsius, 60 degrees Fahrenheit. The cool, almost cellar temperature gives the wine more freshness and lift. Domaine de l’Aurage is best paired with all types of classic meat dishes, veal, pork, beef, lamb, duck, game, roast chicken, roasted, braised and grilled dishes. Domaine de l’Aurage is also good when matched with Asian dishes, rich fish courses like tuna, mushrooms and pasta. Fortunately for savvy, wine loving consumers, the wine of Domaine de l’Aurage remains available at a reasonable selling price. Domaine de l’Aurage is a young Bordeaux wine property from the Cotes de Bordeaux appellation to watch. Vanilla, wild strawberry, earth and thyme reverberate here while the endnote displays soft texture, ripe black raspberries and licorice. You will be able to enjoy this on release. Due to the frost, yields were only ten hectoliters per hectare. From a blend of 95% Merlot and 5%Cabernet Franc, the wine shows rich, lusty textures, fresh, sweet black fruits and a licorice coated, black cherry finish with supple tannins. Medium bodied, with good freshness to the fruit, softness to the textures and ample sweetness, the wine is forward, juicy and almost crisp, with more red than black fruit and licorice in the finish. With fennel and cherry notes in the nose, this medium bodied, wine is a light, forward and ends with a fresh, red plum finish. Sweet, fresh cherries, black raspberries, licorice, vanilla bean and spice provides good freshness, sweet berries and ample grip in the finish. Blueberry, coffee, licorice, plum and black cherry aromas open to a round, soft textured, sweet, black cherry filled wine that is already showing great.